Please select a continent on which to install your new country. This country did not ship with an install wizard, so please perform a manual install. Please insure there is enough room on your continent for a clean install. It may be necessary to erase all other nations on the continent to continue installation. Originally built as a demonstration tutorial for Digital Imaging and Illustration students for creating animated .gifs between Photoshop and Illustrator, USAltDel : America is Loading is both a sample animation and a statement. Commenting on the modern trend of cyclical graphics to convey a loading or processing cycle of software performance, this image also comments on the struggles of our young country. 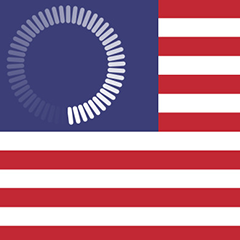 Replacing the stars with rounded ‘hashes’ around a circle in a blue surround calls attention to the upper left. By placing the loading image here focus of the graphic indicates it affects all 50 states. As there are 50 stars, there are 50 ‘hash’ marks… one for each state. In an optimistic sense, the country is still loading itself. This can mean it’s still figuring itself out. Making sure it can run efficiently may be another.Playing nice with other nations (programs), and not tax the system’s storage or memory (citizens?) is still another. We’ve all been there, really. Newly acquired software, clean running system, run the install program, and you’re free, up, and running. The thing about this country is, some believe that the country will never fully form. Given the nature of it’s founding through documents of ideals that are adaptable. In a negative sense, We have a horrifying indication. Given a reign of violence, oppression, racism, brutality, partisanship, etc. plaguing our country in the early 21st century, this is a symbol of a system freeze. If you’ve ever had a piece of software crash, you know of what I speak. I’m a Mac person, and we generally call this the ‘spinning pinwheel of death’. Working in high end or ‘written yesterday for expressly one purpose’ applications, I also see it… a lot. This is a tragic metaphor because when a system freezes resources aren’t being reached. They are not being distributed properly. Memory is misallocated, and storage is fragmented. Even processes or maybe even algorithms panic. Additionally, this is usually all do to flaws of the system not caught by the makers of the program. I’ll let the readers draw their own comparisons as to real-world facsimiles of who or what memory, resources, storage, and processes are. This is where the play on words in the USAltDel comes in. It is in reference to the keyboard shortcut to override any frozen application and bring up a system command menu on a PC. This menu allows you to ‘Force Quit’ (Mac) or ‘End Process’ (PC) of the offending program. Regardless of a pessimistic or optimistic interpretation, America is Loading.